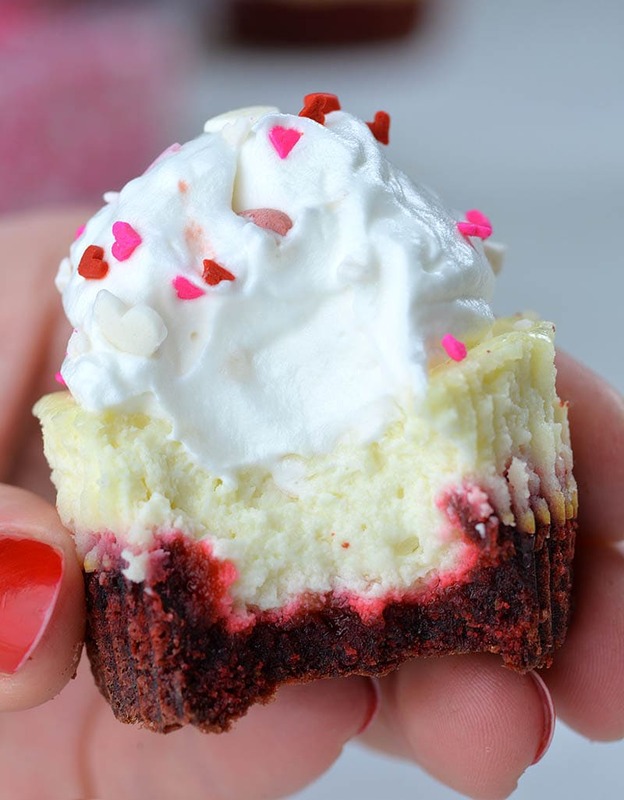 Red Velvet Cheesecake Cupcakes are perfect Valentine’s Day treat that will satisfy anyone’s sweet tooth, and they’re absolutely adorable, too! However, red velvet is so Valentine’s Day thing! It not only looks pretty, but it tastes great, too! Combo of smooth cheesecake on top of red velvet crust packed in individual portion is great way to show your special someone how much you care. 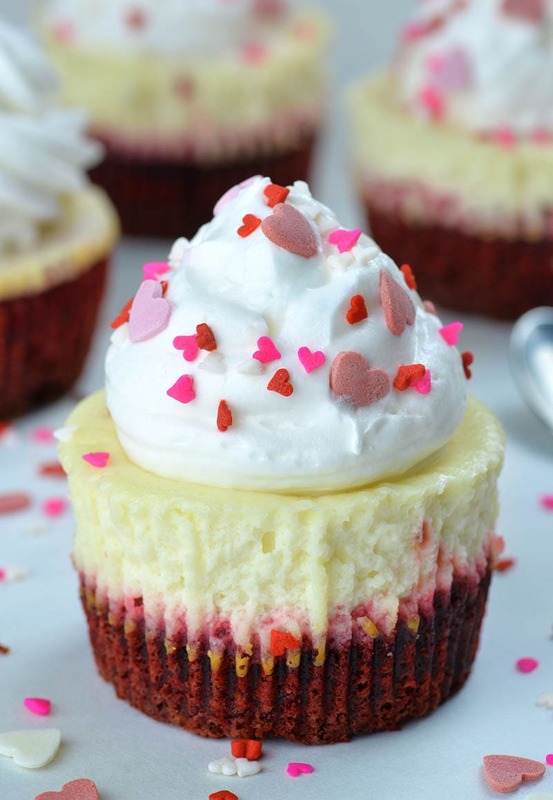 Red Velvet Cheesecake Cupcakes are great idea for homemade Valentine’s Day gift, instead of a basic box of chocolates! These cheesecake cupcakes are perfect for kids and school parties, and definitely delicious dessert for your friends and whole family, too. However, making Valentine’s Day treats should not be complicated or boring. This dessert recipe is so simple and easy and it’s perfect to engage your children to make it. How to Make Red Velvet Cheesecake Cupcakes? These delicious mini bites are consisted of two baked layers and whipped cream on top. Cheesecake layer is so creamy and smooth. So if you are not fun of whipped cream, you can skip third layer. Red velvet and cheesecake are delicious even without the topping. To make the Red velvet you’ll need simple ingredients: flour, sugar, cocoa powder butter, milk, vanilla, egg and red food coloring. First beat butter and sugar, then mix in add egg, milk and vanilla. Finally mix in dry ingredients mix, and red velvet mixture is ready. Spread some of red velvet mixture in the bottom of cupcake liners and pre-bake for 6 minutes. Cheesecake mixture is also very simple to make. Just beat softened cream cheese, sour cream, sugar and egg whites and spoon over pre-baked red velvet. When your Red Velvet Cheesecake Cupcakes are baked and cooled completely top them with whipped cream and garnish with festive heart shape sprinkles and enjoy! 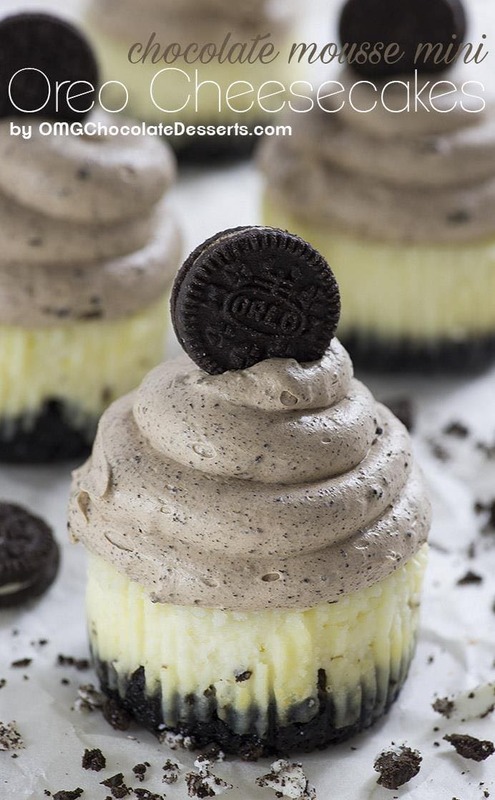 Craving for more desserts like these adorable cheesecakes?! Chocolate Mousse Mini Oreo Cheesecakes – mini cheesecakes with thick Oreo cookie crust topped with light and creamy chocolate mousse. 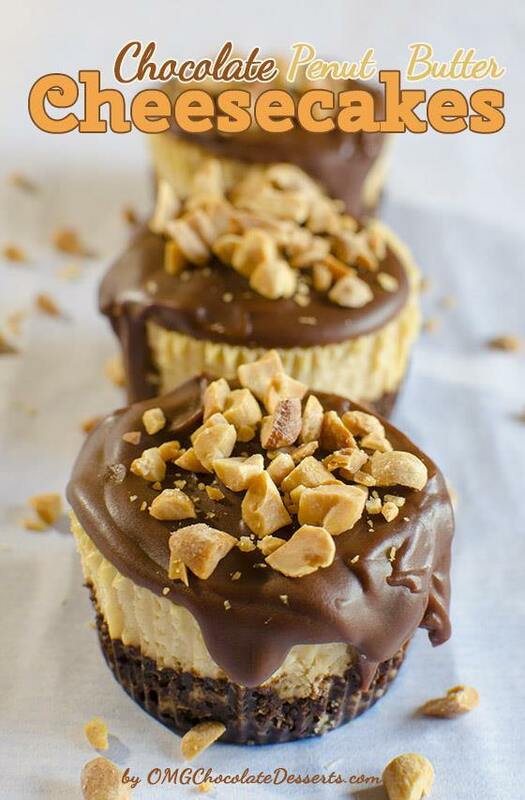 Mini Chocolate Peanut Butter Cheesecakes are delicious individual portions of peanut butter cheesecakes with chocolate graham cracker crust and chocolate ganache topping. Combo of smooth cheesecake on top of red velvet crust packed in individual portion is great way to show your special someone how much you care. Preheat oven to 350 F. Line cupcake pan with cupcake liners and set aside. To make the red velvet layer, stir together flour, cocoa powder, baking soda, and salt together, then set aside. In a large bowl beat the butter on high speed, until creamy. On medium speed beat in the sugar until combined. Then, beat in egg yolk, milk, and vanilla extract. Mix in food coloring. Add dry ingredients into the wet ingredients and mix in on low speed. Add more food coloring if needed. Spread 1 Tablespoon of mixture into the bottom of each cupcake liner (The mixture will be very sticky). Bake 6-7 minutes to pre-bake the crust (slightly prebaked crust will rise and sink in the center, and that’s OK). To make the cheesecake layer beat the cream cheese on medium-high until smooth, then add sour cream and sugar and mix until combined. Add the egg white and vanilla and mix on medium speed until combined. Do not overbeat or the cheesecake will crack. Add 2-3 Tablespoon of cheesecake mixture on top of the red velvet, spreading it to completely covers. Bake for about 18-20 more minutes, until cheesecake topping is no longer jiggly when you shake the pan. Tent loosely with aluminum foil to make sure the tops of the cheesecake does brown. Cool for 30 minutes at room temperature, then refrigerate to set for 1-2 hours. Before serving top with heaping Tablespoon of whipped cream and garnish with sprinkles if desired. Re the red food coloring. No amount listed – is it just to whatever color we want? Recipe sounds scrumptious!!!!!!!!! Hey ! I was wondering , when doing the cheese cake mixture I usually use a whole egg and not just the white. Why did you use the white alone?